Worried about your car being broken into? Here are some key tips to making sure your car and the valuables inside stay safe in your absence. This one is obvious, but it’s worth the extra reminder: Be sure to lock valuables such as your purse, laptop, or camera bag away in your trunk and out of sight. 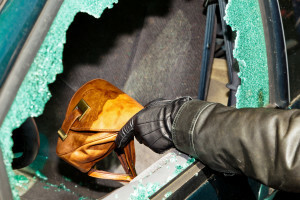 Thieves are not likely to spend valuable getaway time breaking into your trunk. Or better yet, take those items with you. Thieves are criminals of opportunity, and a passer-by who happens to see a valuable item in your car window might seize the opportunity to make a quick theft. Stereos are some of the most frequently stolen items out of cars, so an added measure of protection for your car stereo isn’t a bad idea. Consider removing the faceplate from the front of your stereo and keeping it in your glove compartment. Such a stereo won’t look attractive to a thief looking to sell the stereo on the black market. Be sure that your car is suited with an alarm system that is complete with a blinking light that is highly visible on the dashboard. (If your car’s alarm system does not feature a blinking light, even a fake one will do.) This will deter thieves from the get-go. The dark might serve as a natural hiding agent for what’s lying inside your car, but it also provides the perfect environment for a passing thief to make a quick break-in free of eyewitnesses. This means also being sure to install thief-deterring lighting outside of your home. It can be tempting to try to snag that last, free open spot on the street, but this puts your car in heavier contact with passers-by who might try to break into your car. Moreover, a paid parking area general offers increased security, with security guards and security cameras on watch. Installing a car tracking service in your car—and making it known somewhere on the outside of your car that you have one—will deter thieves from breaking into a car that they know could be tracked. This means not making use of magnetic hide-a-key compartments on your car. Instead, keep a spare key at your home, or with a trusted friend if you keep your house key on your set of car keys. Did you recently lose the key, transponder, or remote to your car? We at ARCO Lock and Key can copy, replace, and create new traditional and transponder keys at a fraction of the cost that a dealer would charge you. And as a bonus, we’ll even come to your home or office, saving you both time and money. If you are a Utah County residence and need help with your car’s keys, don’t hesitate to give us a call.